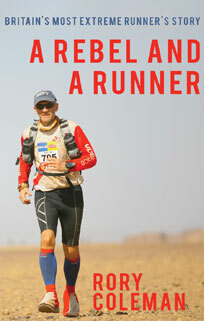 'A Rebel and a Runner' is a 164pp paperback book about the life and adventures of Ultra-Runner, Rory Coleman. It's an honest account of 23 years of extreme running that covers 1,000 marathons, 14 Marathon des Sables and 9 Guinness World Records. If you are looking for inspiration for your next event, you'll find it here as it covers the highs and lows of one individual's life journey.